In an effort to use “the belly” to it’s fullest extent, we just couldn’t cover it up! With our coming arrival, we also wanted to keep with the “kiddo” theme. And so was born Humpty-Dumpty, the before and after. This pregnant woman costume took several days to put together, but it really was easy. We had to paint the boxes like brick walls and cut out all but the four sides. We did reinforce the corners with some extra cardboard to make sure it kept it’s shape. Then we attached a string to the front and back of the boxes and we used that to drape them over our shoulders. I took some old fabric that I had and sewed four tubes about 15 inches long to use as legs and then stuffed them with hand towels and pinned them inside of the baby shoes that had been given to us for our son. We attached the “legs” to the inside of the boxes so that they looked as they were hanging over the wall. Next came the “face” painting. I had a friend paint the egg and face onto my belly (with my belly button as the nose.) WE just painted an egg face, complete with cracks and band-aid, on one of my hubby’s t-shirts. We used a plastic bowl under his shirt to give the illusion of a tummy. It took us a while to find the right bowl, and we finally settled on a football shape. We really had a ball with this. It actually took people several minutes to realize that it was really my tummy that they were seeing, and not a shirt. It made me so proud to be showing off what at times brought me so much unwanted attention. If you try this, expect some laughs! It is really fun. It would work without a partner as well. I loved your ideas and others. I am trying to convince my fiance of being dressing the same for Halloween. I too, am 23 or 24 weeks pregnant of as this Friday. Our baby is due this January 10-15, and we are again having a baby boy. I am glad that simple ideas are best especially with economy being so difficulty these days. Can’t wait to use this costume idea! I am a teacher and a few years ago painted my 7 month pregnant belly as a pumpkin and dressed as a farmer. It was a hit! I feel like I need to top that and being 7 months prego again, I feel this may do it! Love it! awww that is so cute!! 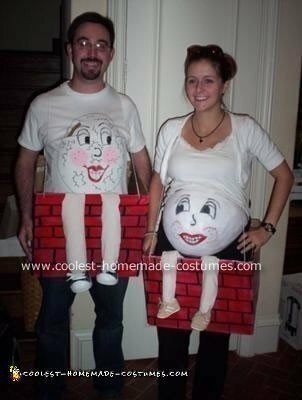 i am 7 months pregnant && i think i am using this idea. what kinda paint did you use though on your tummy? i want something that doesn’t fall off since i do have a little stretchmarks. thanks try to get to me asap! That is so cute and so creative! I am definitely doing this for Halloween! Most of what I have been seeing is basketballs painted on and things like that… so this idea is refreshing! I love it (especially the part that its homemade lol)! i made this costume! it was a BIG hit!!!!! Sorry that I didn’t get back to you in time regarding what type of paint. If I remember correctly, I just used craft paint that you get at hobby lobby. It itched a little but it was no problem. You could use face paint as well. but my friend is throwing me a baby shower next weekend and it is a nursery rhyme dress up theme.. im using my 30week pregnant belly to the fulest with this awesome idea. thankyou sooo much! !